During Andrew Johnson's rise to political power, the former senator and military governor of Tennessee and Abraham Lincoln's vice-president had become an advocate of the small farmers over the large planters, but he shared the racial attitudes of most white yeomen farmers. "Damn the negroes," proclaimed the War Democrat to a friend during the war, "I am fighting those traitorous aristocrats, their masters." His tough talk about the rebel leaders initially delighted the Radical Republicans. They soon changed their minds when Johnson revealed his beliefs about readmitting the Southern states to the Union. The Radicals, long involved in the antislavery cause, were less than pleased to hear the strict constitutionalist Johnson argue that "there is no such thing as reconstruction. Those states have not gone out of the Union. Therefore reconstruction is unnecessary." When Congress met in December 1865 for the first time since Lincoln's death, all but Mississippi had accepted Johnson's lenient requirements for readmission issued earlier that year through a series of proclamations. Though they approved the 13th Amendment abolishing slavery, the Southern states had restored the old elite to power and sent all-white delegations to Washington, including many former Confederate leaders. Outraged Radicals, joined now by the moderates, simply omitted them from the roll call, effectively denying them and their states admittance. The struggle over who would control Reconstruction was underway. In an inversion in constitutional reasoning, secessionists--and Johnson--argued that the states never left the Union, while some Radicals began arguing that they had, and should now be treated like conquered provinces, subject to the control of Congress. Their concept did not emerge triumphant until 1867. The year 1866 saw the decline of Johnson's power and influence. In February, his veto of a bill to extend the life of the Freedman's Bureau, which provided relief to destitute blacks and whites, was upheld by the Senate. The overturning of his vetoes of a new Freedman's Bureau bill and the Civil Rights Act that negated the Black Codes later that year signaled his fall from favor with the Republicans. His vetoing of the Military Reconstruction, Command of the Army, and Tenure of Office Acts in 1867, along with his public attacks on Congressional challenges to his powers and his continued defiance of their wishes, laid the foundation for a constitutional showdown in 1868. Throughout most of 1867, the House Judiciary Committee, irritated by Johnson's hostility to their agenda, investigated possible illegal actions on the part of the President, but failed to convince the House that grounds for impeachment existed. But Johnson himself provided the opportunity to do so when he deliberately violated the Tenure of Office Act in order to test its constitutionality. Tired of Secretary of War Edwin Stanton's opposition and his refusal to resign from the cabinet, on August 12, 1867, Johnson removed Stanton from office, and replaced him with General Ulysses Grant, without receiving consent from the Senate as required by the law. When the Senate refused to approve the move, the House had grounds to vote impeachment. Of the eleven articles of impeachment, eight addressed Johnson's violation of the Office of Tenure Act. Article 9 accused the president of issuing orders in violation of the Army Act, which required that all orders from the president, as commander-in-chief, go through the office of the general-of-the-army. The last two articles essentially charged him with criticizing Congress by "inflammatory and scandalous harangues." 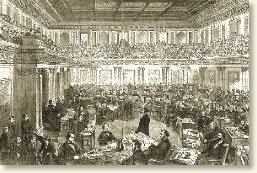 The Senate trial opened March 5 and lasted until late May, with Chief Justice Salmon P. Chase presiding. On May 16, enough Republicans joined their pro-Johnson colleagues to prevent his conviction by one vote. They broke ranks mostly because they feared the consequences of removing a president for largely political rather than criminal reasons, and they opposed the economic and social agenda of the Radicals. To blunt further opposition, Johnson agreed not to obstruct the process of Reconstruction, thereby allowing Congressional Reconstruction to begin in earnest. Ironically, the failure to remove Johnson dealt the Radicals a political blow, damaged their morale and support, and ultimately led to their downfall. "On May 16th the vote was taken. Every one who by any possible means could get a ticket of admission to the Senate chamber produced it early that morning at the Capitol. The floor and galleries were crowded. The journal was read: the House of Representatives was notified that the Senate, 'sitting for the trial of the President upon the articles of impeachment,' was ready to receive the other House in the Senate chamber. The question of voting first upon the eleventh article was decided. 'Mr. Anthony.' Mr. Anthony rose. A sigh went round the assemblage. Yet Mr. Anthony's vote was not in doubt. A two-thirds vote of thirty-six to eighteen was necessary to convict. Thirty-four of the Senators were pledged to vote against the President. Mr. Fowler, of Tennessee, it was known, would probably vote for acquittal, although there was some doubt. Senator Ross was the sphinx; no one knew his position. The same form was maintained with each Senator in turn. When Fowler's name was reached, every one leaned forward to catch the word. 'Not guilty,' said Senator Fowler. The tension grew. There was a weary number of names before that of Ross was reached. When the clerk called it, and Ross stood forth, the crowd held its breath. 'Not guilty,' called the Senator from Kansas. It was like the babbling over of a caldron. The Radical Senators, who had been laboring with Ross only a short time before, turned to him in rage; all over the house people began to stir. The rest of the roll-call was listened to with lessened interest, although there was still the chance for a surprise. When it was over, and the result - thirty-five to nineteen -was announced, there was a wild outburst, chiefly groans of anger and disappointment, for the friends of the President were in the minority. I ran all the way from the Capitol to the White House. I was young and strong in those days, and I made good time. When I burst into the library, where the President sat with Secretary Welles and two other men whom I cannot remember, they were quietly talking. Mr. Johnson was seated at a little table on which luncheon had been spread in the rounding southern end of the room. There were no signs of excitement. All rose. I made my way to the President and got hold of his hand. The other men surrounded him, and bean to shake his hand. The President responded to their congratulations calmly enough for a moment, and then I saw that tears were rolling down his face. I stared at him; and yet I felt I ought to turn my eyes away. It was all over in a moment, and Mr. Johnson was ordering some whiskey from the cellar. When it came, he himself poured it into glasses for us, and we all stood up and drank a silent toast. There were some sandwiches on the table; we ate some and then we felt better. In a few minutes came a message of congratulation from Secretary Seward to 'my dear friend.' By that time the room was full of people, and I slipped away." Crook, William, H, Through Five Administrations (1910); Foner, Eric. A Short History of Reconstruction (1990). "The Trial of Andrew Johnson, 1868," EyeWitness to History, www.eyewitnesstohistory.com (1999). Senator Ross, the man whose vote saved President Johnson, was ostracized and physically attacked in his native Kansas. Unable to gain re-election, or to achieve any economic success, he died in poverty. 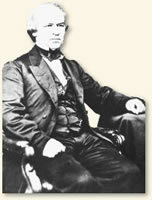 Johnson was not nominated to run for re-election in 1868. He returned to Tennessee where he successfully ran for the U.S. Senate in 1874. He gave his last speech on the Senate floor in March 1875 and died of a stroke in Tennessee shortly thereafter.